Veronica Darling: OK OK, the best tights ever! OMG, here's what I look like at 30 weeks pregz! I'm so proud of him that his work has taken off, he's in demand and we're saving money (for let's face it, we have a deadline coming up that could majorly change our financial situation)... but when you're working for yourself, there's so much more to think about! 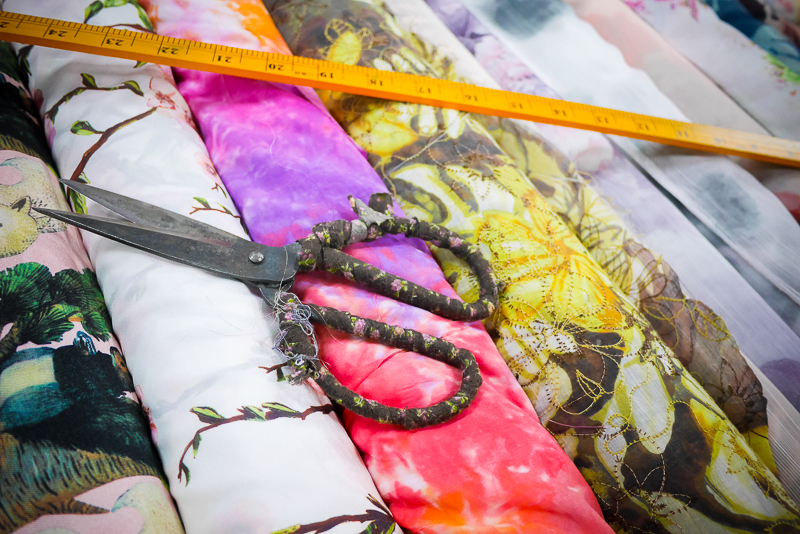 The poor darling has hardly time to invoice, so voila! I employed myself as his bookkeeper and am learning online software so our accountant doesn't go ballistic at us! "BORING!" you're yelling at me, right? I'm such a nerd about some things... I love being the bookkeeper. 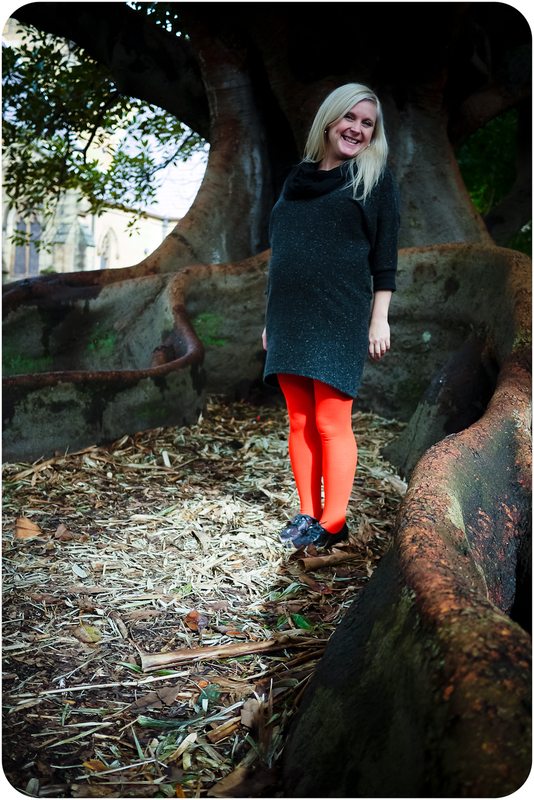 ANYWAYS, Husbie finally took some time out so we could have a little holiday AND he took some photos of me in Newtown, wearing my darling darling darling friend Emina's orange bamboo tights. Yep, she makes the best tights (and these ones are on special at the moment!) and sells them at her darling darling darling store OK OK in Sparta Place, off Sydney Road in Brunswick. I also bought some woolie ones, some ribbed ones, and some ... brown/tan ones that look great with floral stuff... so if you're stuck for original looking tights this winter, Emina has a pair for you. When I was in last week, she was having a clearance sale on clothing, but if you check up with her Facebook updates, you'll see what's going down as she always has great stuff going down. 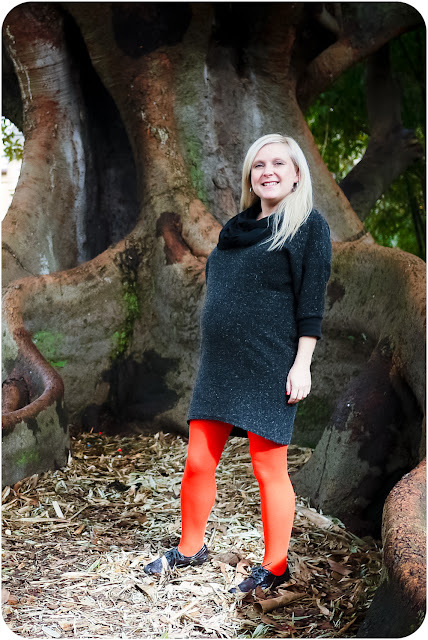 But you know I've blogged about Emina at OK OK before, especially because she stocks the best range of .... MELISSA SHOES. I'm wearing my brogues Melissa's here in the photo too! The dress is a Country Road (wait for it) dress I found at the op shop, that appears to be a normal batwing dress, but is PERFECT for my roundness and shortness... I am wearing a cowl scarf with it (a scoop loop cowl of course!) and I was surprised for in Sydney (during the day) ... one does not need a jacket! OMG!